Recently, at the auctions of some prestigious art auction houses in the world, many works of Vietnamese artists have been sold successfully, even with paintings up to millions of US dollars. It can be said that Vietnamese fine art, especially the generation of artists during the Indochina Fine Art Colleges period (1925-1945), is attracting a lot of attention from the international market. Pham Hau's work reached the price of over US$ 1 million at foreign auction floors. For many years, at prestigious auction floors in various countries and territories such as the UK, the US, France, Singapore, and Hong Kong (China), Vietnamese paintings, with most names belonging to the Indochina Fine Art Colleges period, such as painters Nguyen Phan Chanh, Nguyen Sang, Duong Bich Lien, Le Pho, and Pham Hau are always welcome. For a long time, Vietnamese paintings have made a mark on the world art market, sought by many collectors. The market once recorded successful auctions of Vietnamese paintings, including the auction on the Modern and Contemporary Southeast Asian Art in Hong Kong (China) on April 1, 2016 at Sotheby's Art Auction House. The auction had 168 works by famous artists of Southeast Asian Art, including some faces of Indochina Art, such as Vu Cao Dam, Mai Trung Thu, Nguyen Van Ty and Bui Xuan Phai. Accounting for 25% of the total number of auctioned works in this auction, the Vietnamese paintings attracted a lot of attention from collectors, with the price being many times higher than the starting price. As a result, 43 out of 45 the works were successfully auctioned. In fact, Vietnamese paintings cost millions of US$ on international auction floors. In the Modern art evening sale auction on September 30, 2018 at Sotheby's Hong Kong, five paintings by the famous artists Nguyen Phan Chanh, Le Pho, Nguyen Gia Tri and Vu Cao Dam were sold for a total of nearly US$2, 5 million. Earlier, the picture named ‘Family Life’ by painter Le Pho was auctioned at Sotheby’s Hong Kong on April 2, 2017 for HKD 9.1 million (equivalent to US$ 1,171,005). 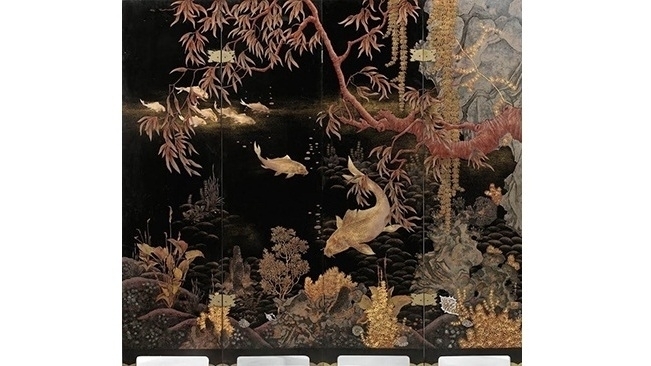 Recently, on March 31, 2019, for the second time in the auction history, the picture named ‘Nine Carps in the water’ of painter Pham Hau (composed in 1939-1940) reached a price of US$1,168,803 (with tax).Vietnam paintings are world-class, that is a pride of the country's painting. It can be said that the sustainable vitality of painting in the Indochina Fine Art period on the international stage is confirmed. After a generation of famous painters sold abroad, such as Hong Viet Dung, Le Thanh Son, Nguyen Trung, Nguyen Thanh Binh, Do Quang Em, Dang Xuan Hoa, Thanh Chuong and Pham Luan, some faces of the next generation in recent years can be mentioned, such as Nguyen Truong Linh, Nguyen Phuc Loi, Vu Dinh Tuan, and Dinh Thi Tham Poong. Typically, at the auction of Christie's Hong Kong in May, 2018, the picture named ‘165 ° W’ of painter Danh Vo, who is an artist born in 1975 in Ba Ria - Vung Tau and grew up in Denmark, caused a surprise when it was sold for HKD 1,625,000, equivalent to more than US$ 207,000. It is worth noting that most of the high-value Vietnamese paintings on international auction floors went to domestic collectors. The main reason is that in the last 30 years (1986 - 2016), most of Vietnam's beautiful paintings were sold abroad, so domestic collectors must accept to buy through live or online auctions. About the study of art, the trend of spending millions of US$ to own a masterpiece of Vietnamese painting is becoming popular, because this is a sure and lucrative investment channel. The paintings receiving the most interest from collectors are the work of the painter generation in the Indochina fine art period. According to Vu Huy Thong, an art researcher, the period attracted international and domestic collectors because of the rarity and stability of the painters who have been recorded with the strong, pure Asian spirit that the later lines of paintings are less available. Meanwhile, contemporary paintings of young artists have many risks in investment. Besides, reliability from international prestigious art auction addresses is also a reason for the collector to "hunt" for the paintings. Of the approximately 200 paintings owned by collector Nguyen Minh, more than half were successfully auctioned from abroad. According to him, the standard working style and transparency in the evaluation of world-famous auction houses make buyers feel secure. For a long time, fake paintings caused Vietnamese art to "lose points" both in the domestic and international market. But the successful auctions and especially some works that exceed the price of million USD in the international market recently have regained some faith and excitement of art lovers with Vietnamese painting. Recently, the Institute of Criminal Science of the Ministry of Public Security officially participated in appraisal activities and supported the detection and handling of fake paintings. The positive efforts have contributed to building a transparent and healthy art market. Besides, it is also necessary to pay attention to the investment of the State in devoting funds to buy precious works for the Fine Arts Museums and some valuable cultural and historical addresses, aiming to help the public to enjoy the quintessence of Vietnamese art, balance the market, avoid being profiteered by private.